Whose idea it was to switch the keys is not important. We both knew it was wrong, yet my sister and I deliberately abandoned our customary roles as good little girls. We were in Lakewood once again for two weeks at the invitation of Aunt Virginia who owned The Monterey. It was August 1948. I was ten and Nancy was eight. This year, instead of sitting on a Greyhound bus or a train that took hours, we arrived at the hotel in the green Hudson Dad had bought shortly after the end of the war. During the ride from our quiet Brooklyn neighborhood Nancy and I remembered some of the fun of previous years when we discovered the back staircase which we used to explore the hotel’s nooks and crannies and to spy on the maids and handymen. As soon as Dad parked at the curb, we were out of the car careening up the steps and across the lobby until we found the poster for the Strand theatre. We knew from previous years that the movie playing there would be the same as the one now playing at Radio City Music Hall. That meant we wouldn’t have to wait a whole year to see it at a theatre in our Flatbush neighborhood. By today’s standards The Monterey was not a big hotel. 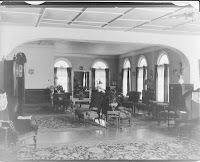 The main floor comprised a large lobby filled with over-stuffed high back chairs, and a writing room adjacent to the reception desk. Rising from the reception desk was a circular staircase that led to two floors of guest rooms. From the third floor, Nancy and I could look down over the banister and see who was checking in or leaving. One time, with our cousin Greg as a resistant accomplice, we dropped a long piece of string to see if it would reach the person at the desk. Back then, hotel keys had leather tags embossed with the room number. Guests were asked to leave their keys at the reception desk whenever they left the hotel to spend a day at the beach or to enjoy dinner at a local restaurant. Guests complied by putting their keys in the pigeonholes marked with their corresponding room number. ﻿﻿﻿﻿﻿﻿﻿ Late one afternoon with nothing to do, Nancy and I came up with an idea. As I said, I don’t remember who thought of it so we always considered ourselves equally to blame. Suppose we mix up the keys? We could then sit unnoticed in one of the big high back chairs in the lobby and peek out to see the reactions of the guests when they couldn’t open their doors. The Tally Ho cocktail lounge was situated just off the lobby. 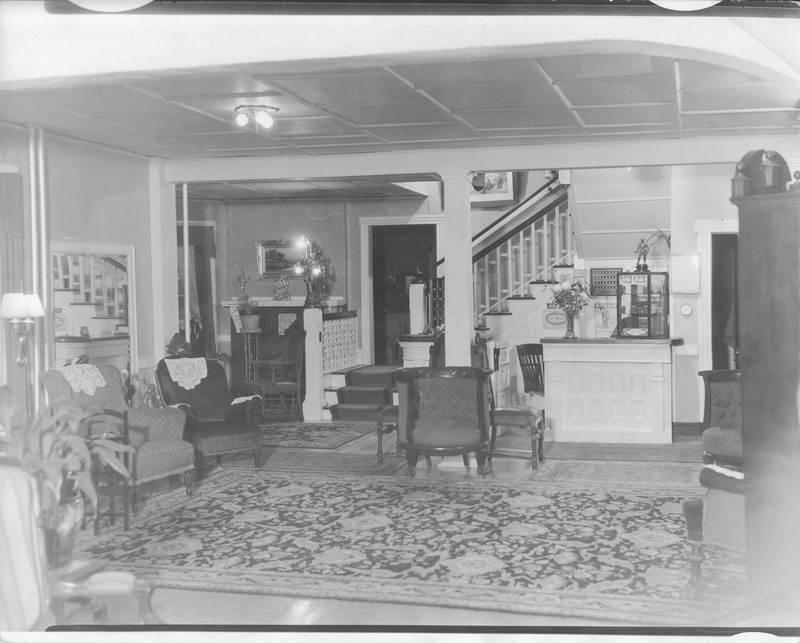 Decorated with wallpaper that featured fox hunt scenes, a fireplace, some small tables, and a grand piano, it was the place not only for hotel guests but also a regular gathering place for Lakewood residents. While all the adults seemed preoccupied – either sitting on the large wrap-around front porch or enjoying a cocktail in the Tally Ho, Nancy and I quietly headed for the reception desk and started moving the keys around. No one caught us. Not yet, anyway. It took only a few minutes for guests to hurry down the stairs to complain that their keys weren’t working. Some realized that the leather label with a number emblazoned on it didn’t match their room number. Mom and Dad who were sitting in the Tally Ho heard the commotion at the desk and soon realized what must have happened. Our little plot was uncovered and we were scolded. Even Aunt Virginia who never raised her voice let her anger show. And Uncle Tom, who we feared anyway, made us cry and apologize. We shared the guilt and both deserved the scolding. Years later, Nancy and I continued to laugh about that time because we both recognized that it was the first time we deliberately set out to cause trouble. Besides Aunt Virginia, Uncle Tom and Greg who lived in an apartment off the lobby, there was just one other permanent resident: Polly, a former “Ziegfield Girl” who was now nearly blind. Everyone in Lakewood, it seemed, met regularly at the Tally Ho. In this large circle of friends was a man named Les who reminded my sister and me of the actor Joel McCrea. Whenever he came to The Monterey, he’d give Nancy and me great big hugs – and he became the first person my sister ever developed a crush on. Though children did not venture into the Tally Ho in the evenings, we often sat at the bar in the afternoon and had a glass of Sarsaparilla. One year we were told we had to keep a secret. Behind a doorway in the Tally Ho a slot machine had been installed. I didn’t understand then why it was a secret, but I kept quiet about it. The best thing about the Tally Ho, however, was Max, the piano player. On weekend evenings, the sounds of his wonderful music could be heard all the way up to our room on the third floor. To this day, whenever I hear “Lazy River,” I think of Max and the Tally Ho. All the guest rooms were covered in flowery wall paper that even extended across the ceilings. None of the rooms had a private bath. I liked staying in Room 66, not only because Max’s playing was loud and clear here but because of the bathroom which was midway down the hall. It had been constructed into two compartments. Once you entered, you had to go through a second door to find the claw foot bathtub sitting all alone in a large area beneath a skylight. 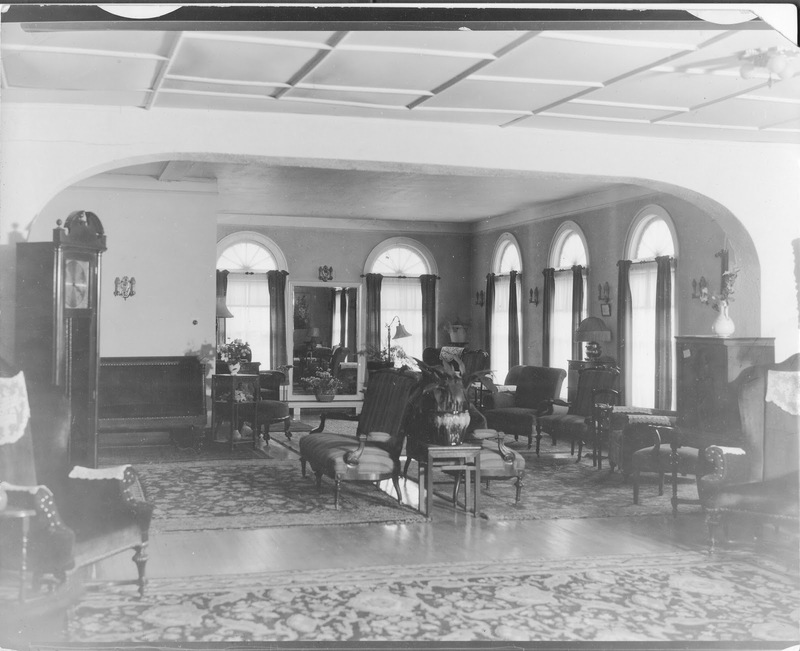 Another evening when my mother was sitting in the lobby reading “Nightmare Alley,” a tall, handsome man entered the hotel and requested six rooms – one for himself and five doubles for the ten young women with him. My mother must have suspected something was wrong, because a little while later while the group was settling in, she knocked on one of their doors. I was with her but did not quite understand the conversation at the time. I do remember her trying to dissuade two of the young women from continuing the trip. “Why?” I asked. My mother told me they were headed for Atlantic City to “sell magazines.” But, I wondered, why did she advise them not to go? The next morning the two young women were in the group as it left The Monterey and headed south on Route 9. When I wasn’t playing with Nancy, I’d sometimes be in the writing room. A couple of large leather chairs sat before desks covered with green blotters. Pens and ink bottles, writing paper and envelopes beckoned me to write to my aunt in Queens and my young friends in Brooklyn and tell them all about my wonderful adventures. Though most of our fun we found right in the hotel, there were times when the town itself offered new experiences. On some mornings, my sister and I walked with Dad down to Lake Carasaljo where we fed the ducks. Sometimes we’d walk along the shore until we came to the grounds of Georgian Court College. We learned then that the town of Lakewood had once been a resort for affluent New Yorkers and that the beautiful grounds and buildings of Georgian Court College had been built in 1898 by millionaire George Jay Gould. Everything we enjoyed was within walking distance– the Strand Theatre, Taylor’s Pharmacy where we sipped our chocolate sodas, and even the grocery stores. And on Sunday afternoons a popcorn vendor set up his cart on a corner a few blocks away. Sometimes Nancy and I would be sent around to the grocery store to pick up a few items for Aunt Virginia. Never given cash, we were instructed to say to the store owner, “Just charge it to The Monterey.” I’ve often wished I still had that option. My sister and I would recall those days as the innocent and simple times before our lives became more serious and more complicated than switching around a bunch of keys.